This week I observed three sermons in sign language for three Deaf audiences, all on the same mass reading, Matthew 3:13-17. It’s appropriate that I received homiletic messages “in three’s” this particular week, because tradition tells us that this gospel story is the first revelation of the trinity. As John baptizes Jesus, we see all three aspects of the trinity at the same time: Jesus the human being standing there in the flesh, the Holy Spirit descending in the form of a dove, and the Father as a voice from the sky proclaiming “This is my beloved son.” In similar communicative diversity, the three homilies I saw included one sermon delivered as the human body signing, one spoken sermon mediated through visual signs in the form of an interpreter, and one sermon delivered through the aether via the Internet. The first homily was delivered in American Sign Language (ASL) by Fr. Christopher Klusman at St. Roman Catholic Church in Milwaukee. The gospel reading had also been delivered in ASL by Deacon David Sommers, also Deaf. I loved seeing Deacon Dave’s visual rendition of the baptism story — the water drenching Jesus’ head in the form of fingers trickling over his scalp; and especially the dove, which Deacon Dave embodied in giant form, flapping his arms at full length in a surprisingly graceful image that immediately called to mind Da Vinci’s iconic painting of the baptism. Then Fr. Christopher stood in front of his assembly, the regular 6 pm vigil mass at St. Roman Church. About 45 people attended, several hearing but mostly Deaf parishioners. At 37, Fr. Christopher is among the youngest of the few Deaf priests in the world. He has a reputation for being a great teacher and having a shining charism for joy, both apparent in his homily Saturday evening. 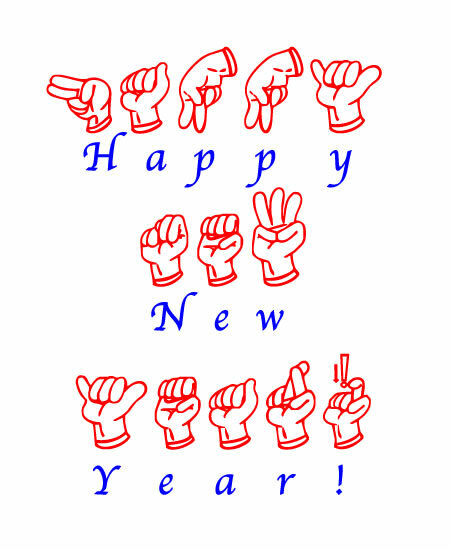 For many Deaf signers, Fr. Christopher’s visual explanation of the symbolic meaning of baptism may be the first time the story had been presented in a language accessible to them. He spent time discussing baptism as a new birth into the family of the trinity, and he explained how holy water at the entrance to the church is a remembrance of baptism. Fr. Christopher’s preaching style makes use of his whole body and a significant area of space around him, so that viewers get a clear image of baptism as going down, under water, and then rising up again, which in the language of gesture is distinctly similar to being buried and resurrected. Then, Fr. 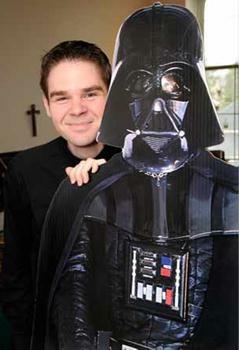 Christopher used an example that is familiar to just about every American: the revelation of Darth Vader as the father of Luke Skywalker in the iconic movie from the 1980s, Star Wars. Everyone, Deaf and hearing alike, perked up and began to wonder where he would take this. Of course it was a negative example, ending with Luke crying “Noooo!” and denying his parentage from the Dark Side. Fr. Christopher vividly called to mind the famous battle scene, his fingers representing dueling light sabers in an expanded and dramatic use of space. For a moment he was Darth Vader himself, holding four fingers over his mouth upward from the chin in the sign imitating Vader’s mask. However, Fr. Christopher went on to compare how in the gospel story, Jesus does the opposite, showing everyone his resounding Yes! as he acknowledges his parentage, which is, Fr. Christopher says, also our adopted parentage. It is a message for all nations, he says, as the first reading from from Acts of the Apostles explains about those who had been in exile but still fear God. Because he is preaching for a mixed Deaf-and-hearing audience, Fr. Christopher then needs to explain that last analogy: For many years, even to this day, the Deaf were in exile like the Israelites before the time of Jesus, but through Christ all people can be united in one body by receiving baptism. For Catholics, the sacraments represent ideal accessibility, and the signed language makes good on that promise for a Deaf audience. Most of the hearing people in the audience received Fr. Christopher’s sermon through the voice interpretation of Theresa Schmechel, a licensed interpreter who has done work for the church since before Fr. Christopher’s ordination. When I interviewed Theresa afterwards, I learned some interesting things about the role of female interpreters in a signed Mass. In the Catholic Church, a man in a priestly role is required to proclaim the gospel and preach, as a reflection of the human form of Jesus (in persona Christi). When a female interpreter is involved, however, the audience receives a woman’s voice or (in the case of the homily I witnessed the very next day), even a woman’s body as the media through which the message of God is conveyed. A former bishop of the Archdiocese of Milwaukee would not allow female interpreters in this role. Theresa’s part in the event gave me a lot to think about. The sermon I observed the next day was likewise on the baptism of the Lord and delivered by Fr. David Cooper, pastor at St. Matthias Catholic Church, just a few short miles away in downtown Milwaukee. The scene here was also tangibly warm and accepting of both hearing and Deaf people. A section of pews is reserved in the front for the Deaf community so they can see the priest. Most of the older Catholics in the area go to this longer-established Mass, because they are used to the location and the mode of interpretation. (There is, however, an ASL mass each month at St. Matthias, celebrated by Fr. Christopher in sign language with no voice interpreter, and attended by about 100 Deaf and hard-of-hearing parishioners.) This homily was also on the meaning of baptism and the revelation of the trinity, and Theresa’s ASL interpreting was visually clear, making use of an expanded signing space that is similar to Fr. Christopher’s style. Her body rocked forward slightly as she signed to the assembly in a way that mirrored Fr. Christopher the evening before. It made me wonder how much the interpreter’s style is influenced by a particular priest whom she interprets for regularly, perhaps similar to how artists in the same studio influence each other’s style. What stood out to me most about St. Matthias, though, was the way the whole congregation incorporated sign language into parts of their liturgy, including some of the mass responses and the psalm response. Fr. Cooper himself singed these small parts, taking a minute or two to teach the hearing parishioners these movements so that they could sign along as a united group. The spirit of unity among people of different cultures was, literally, tangible and embodied. The third and final homily I watched this weekend was Fr. Mike Depcik’s video recording on his vlog, Fr. MD’s Kitchen Table. Fr. Mike’s vlog is for many Deaf Catholics without sign language access in their parish, the only available resource for accessible homilies and Mass readings. But it is also the only extensive resource for preachers of the word who want models of ASL homilies for any particular day in the liturgical calendar. In my interview with him this week, Fr. Christopher Klusman expressed great admiration for Fr. Mike as a mentor and model, since he is also among the few culturally Deaf priests in the country. Fr. Mike’s sermon is short and to the point, which is ideal for the vlog format. In the first minute, Fr. Mike gives a brief retelling of the baptism story in ASL. I love the way he easily embodies first Jesus, then John, then God the Father, then the spirit as a dove, all by a small turn of his body and direction of his head while he signs. His message is about how God’s plan for us may be different from what we would want, but it is always better. Fr. Mike does not use much space in his video, just the area in front of his body that fits within the frame of the video image. Even in a small signing space, he is able to give a full picture of the reading and then preach one strong, clear point about it — all in two minutes. Few homilists could do the same as skillfully and efficiently in spoken English. Sometimes it is hard to be an academic when I want to be a writer. While I want to write stories about interesting and inspiring people’s lives, I am obliged to plan classes, administer student programs, and (in my spare time) write jargon-laden articles for fellow academics. The good news is that 2013 is the year I had a great I idea: by writing about the lives of Deaf preachers, I can put my specialization in rhetoric to work and write a good nonfiction story that will inspire laypeople of all sorts. First you’ll hear about my upcoming research trip to Milwaukee, where I’ll meet and see Fr. Christopher Klusman preach in ASL. I can’t wait to meet Fr. Christopher, whose ordination was documented in the EWTN documentary Hearing God. By all accounts, Fr. Christopher has an unusual gift for joy. On the same trip I’ll be meeting Fr. Carmelo Guiuffre, the first profoundly deaf priest in Milwaukee, who first came to my attention in that same documentary. You might say Fr. Carmelo has been an invisible deaf priest, because although he was born profoundly deaf, he has always communicated verbally. Nevertheless, being profoundly deaf, he should have interesting things to say about Deaf Catholics as an audience and Deaf vocations. At Fr. Christopher’s ordination, he talked about the difficulty of being deaf in a hearing world and exclaimed, “This is the first time I actually feel proud to be deaf!” I think that’s remarkable, and it says something about the importance of Deaf vocations and the visibility of preaching in sign language. Soon after that, I’ll post a working Table of Contents and rough outline of my book project, which has the working title Sacred Signs: Portraits of Deaf Preachers in the Catholic Church. At this point, I’m hoping to include 10 to 12 life stories of Deaf priests or deacons. Chapters will be organized by gift or charism rather than having one person’s life per chapter, so we’ll have chapter titles like “Good Shepherds of the Deaf: Pastoral Challenges” . . . “Deaf World, Deaf Missionaries” . . . and “Love and the Gift of Listening.” The book as a whole will be held together with an overarching story about theICDA (International Catholic Deaf Association), a world layperson’s organization that, once led by hearing clergy, is now a main channel for Deaf people teaching others how to minister to and with the Deaf in more inclusive ways. A couple of academic articles for rhetoric journals or conferences are underway right now. You’ll find excerpts or abstracts here, and their content will enhance the multibiography in time. In June, I will accompany my deaf daughter Lena Portolano on her mission trip to Rivne, Ukraine, where she will be doing some public speaking about the importance of early intervention for deaf children. She’ll also be working and playing with special needs orphans in a Christian camp there, and generally pursuing her goal of spreading the word about how good parent-child communication vastly improves the lives of deaf children from underprivileged backgrounds. I know: it’s not exactly Deaf preaching, but it’s pretty darned close and I think readers of this blog will be interested in what we find there. (For those of you who don’t know, Lena herself was a deaf orphan who had no language until almost age 5). If you’re interested in contributing $10 to her Ukraine Special Needs Orphan Fund trip, follow the link. I hope the Ukrainian’s revolutionary activities will have resulted in some positive change by then. If not, I might be posting pictures of me and Lena protesting in the streets! In July, I’ll report on the improved state of the Deaf Catholic Archives at Holy Cross College in Worcester, Massachusetts. Fr. Joseph Bruce, the first Deaf Jesuit in America, has been working there for the past six months, carefully organizing a large roomful of wall-to-wall boxes containing primary sources on Deaf Catholic communities dating back to 1920. He is setting aside a whole section on Deaf priests for me, which is going to make my work abundantly productive! Fr. Joe is an amazing source for the history of Deaf Catholics. He has a memory like a Vatican vault, and every time I visit he brings on a flood of interesting background information. We are lucky to have him preserving and organizing these important primary sources, which might otherwise be neglected or lost. In August, I will accompany Dorothy Stefanik, a former nun who is Deaf, on a road trip toCamp Mark 7 in Old Forge, New York. This place is almost legendary in the world of Deaf Catholics, and I’m thrilled to be able to go with Dorothy, who will no doubt entertain me with stories about how the former hotel and its grounds became a special place for Deaf recreation and spiritual reflection. While I’m there, I hope to meet and see the preaching of Fr. Tom Coughlin, OP, founder of Camp Mark 7 and the first Deaf Catholic priest in the United States. Also on my list of hoped-for contacts at Camp Mark 7 is Fr. Matthew Hysell, chaplain of the Mark Seven Bible Institute. It’s an idea I just had. I may start a series of these when I’m ready. This is only a sampling of the many research trips and writing projects on my list for 2014. If I only finish a handful of what I hope to do, I’ll be happy with my progress and a step closer to a sabbatical year during which completing a full-length manuscript would become my number one priority. On the whole, you can expect more interesting and entertaining portraits of Deaf preaching in the year to come. Thank you for your interest and I invite you to contact me any time you’d like to talk about Deaf preachers and their art.